Please note: this event is sold out. 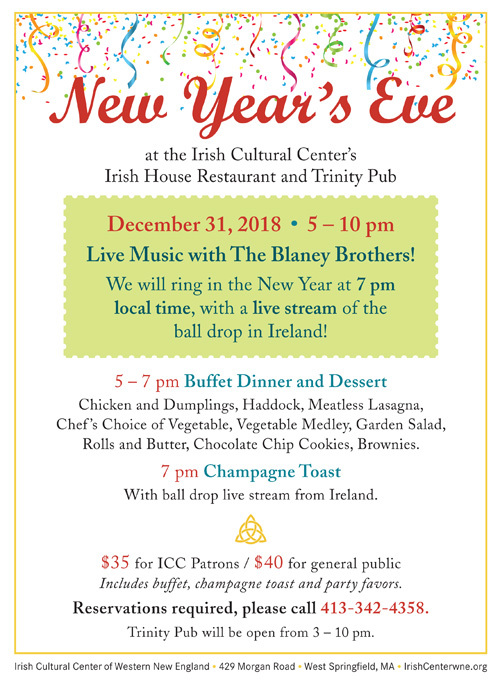 Join us at the Irish House Restaurant and Trinity Pub on the evening of December 31, 2018 as we ring in the New Year at 7:00 pm local time, with a live stream of the ball drop in Ireland at midnight Irish time! Festivities start with a buffet dinner from 5:00 – 7:00 pm, including Chicken and Dumplings, Haddock, Meatless Lasagna, Chef’s Choice of Vegetable, Vegetable Medley, Garden Salad, Rolls and Butter, Chocolate Chip Cookies, and Brownies. Plus, live music with The Blaney Brothers! We’ll celebrate the New Year with a champagne toast at 7:00 pm as the ball drops in Ireland. Cost is $35 for ICC Patrons / $40 for general public. Includes buffet, champagne toast and party favors. This event is sold out. Pub will be open from 3:00 – 10:00 pm.